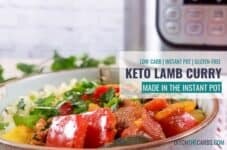 Keto Instant Pot Lamb Curry - plus VIDEO - tonight's dinner sorted! 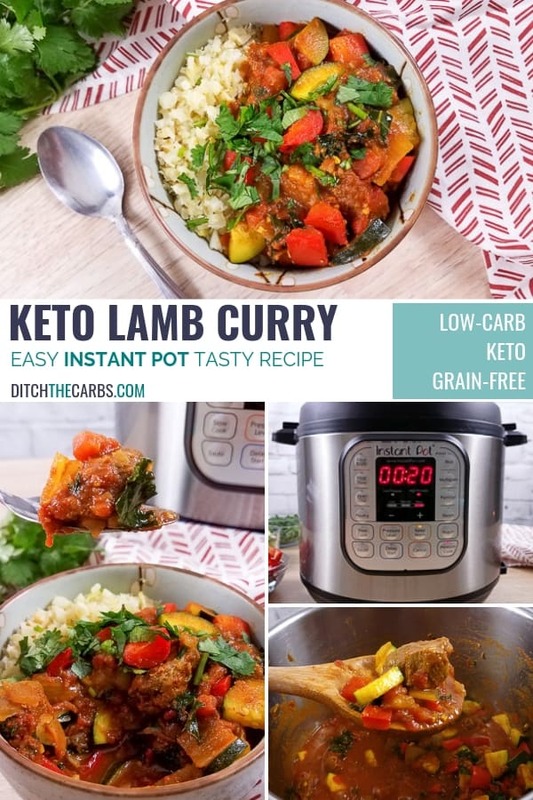 Keto Instant Pot Lamb Curry is a deliciously easy dinner that is ready to eat in 35 minutes. A lamb dish can take hours to cook in the oven. However, with the Instapot lamb only needs to cook for 20 minutes in order to transform itself into a fall apart tender curry. Add in a healthy serving of cauliflower rice and colourful veggies, you have the makings of a perfect healthy weekday family meal. 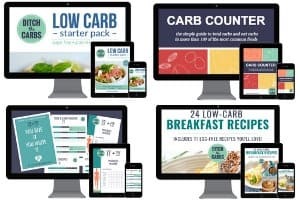 And if you love rice but are beginning low-carb, no problem … I have an amazing low-carb rice recipe below for you. Curry is one of those dishes that can get complicated quickly. 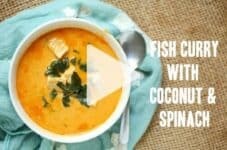 So when creating this recipe I tried to keep it as simple as possible with most of the ingredients being something that you likely have in your pantry already. The main ingredients that you may not have in your pantry already are garam masala. This is a blend of spices like turmeric, saffron, chilli powder, and so on. It is the main seasoning in the curry, and once you taste it you will want to add it to everything. The secret to making this lamb curry so easy and delicious is to melt a little butter at the bottom of the Instant Pot on sauté mode. Once the butter is melted, leave the Instant Pot on sauté and dump in your onions, garlic, ginger, lamb, and seasoning. The lamb will brown and the onions will soften as you measure the spices and mix it all up. 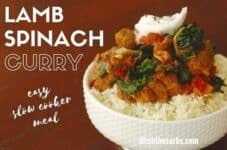 To bring the Instant Pot to pressure I had to use some sort of thin liquid that would have just enough liquid to allow the Instant Pot to come to pressure and yet the minimal amount so to keep the curry thick. Since broth would make the curry watery, I chose to use a can/tin of diced tomatoes with the juice. Between the diced tomatoes and the liquid the lamb releases as it cooks, there was plenty of liquid to bring the Instant Pot to pressure and keep the curry thick. Add lamb, onions, ginger, garlic, and seasoning to the Instant Pot on saute mode. Mix in the diced tomatoes. Cook for 20 minutes with a natural pressure release. Add done! Ready to serve! Once the tomatoes are mixed together, it is time to cook the lamb on high pressure for 20 minutes. 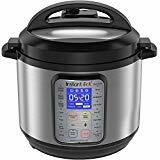 My Instant Pot took about 3 minutes to come to pressure since contents in the Instant Pot were already hot from sautéing. When the lamb has finished cooking, you can do a quick release and turn the valve, but I recommend waiting at least 7-10 minutes before releasing the pressure if you are too excited to wait for all the pressure to release on its own. Finally when the lamb is all done cooking remove the lid and turn your Instant Pot back to sauté mode. Add the kale, zucchini, and bell peppers. Let the curry simmer for about 5 until the vegetables are tender. The sauce in the curry will already be thick, but it will continue to thicken a little more as it cools. 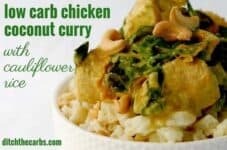 If you like a thinner curry, you may want to mix in 1/4 cup of water or broth to thin it down. 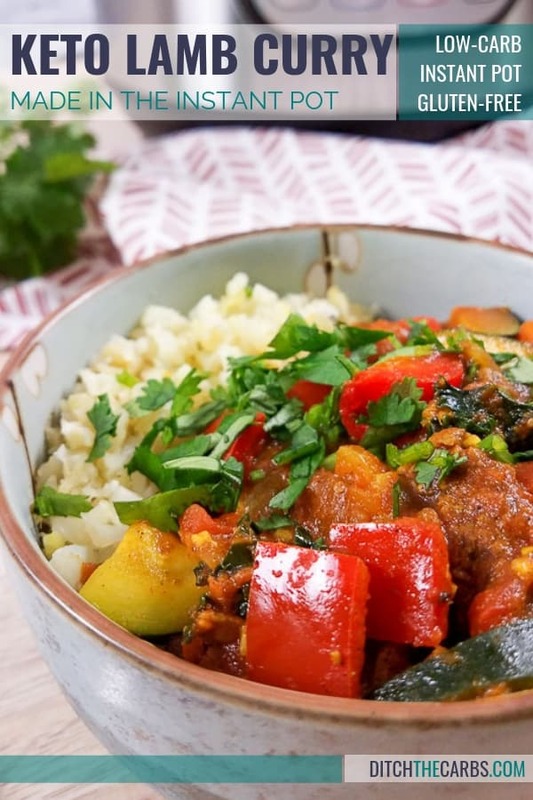 I love a delicious thick curry, but your curry should match the consistency you prefer the most. 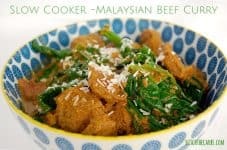 This lamb curry is wonderful all by itself as a stew, but it is also amazing over a side of cauliflower rice. I hope you enjoy it! 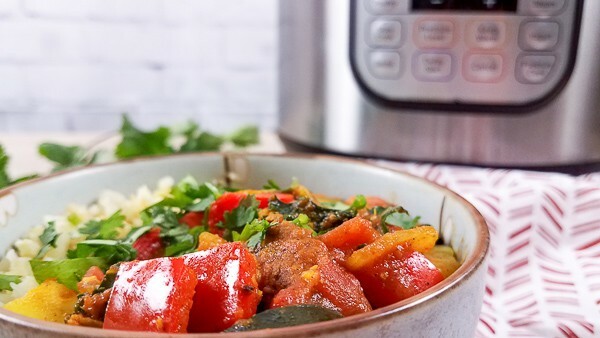 A delicious lamb curry made in the Instant Pot that is ready to eat in 35 minutes! Melt the butter at the bottom of the Instant Pot insert on saute mode. When the butter is melted add the onions, garlic, ginger, and lamb. Give it a quick stir and then add the remaining ingredients except for the kale, zucchini, and bell peppers. Mix well. Close the lid and turn the pressure valve to seal. Cook the curry on high pressure for 20 minutes using the "manual", "pressure cook", " or "meat/stew" button. Let the pressure release naturally for at least 7-10 minutes before manually releasing the pressure. A fully natural pressure release is preferred, but not required for doneness. 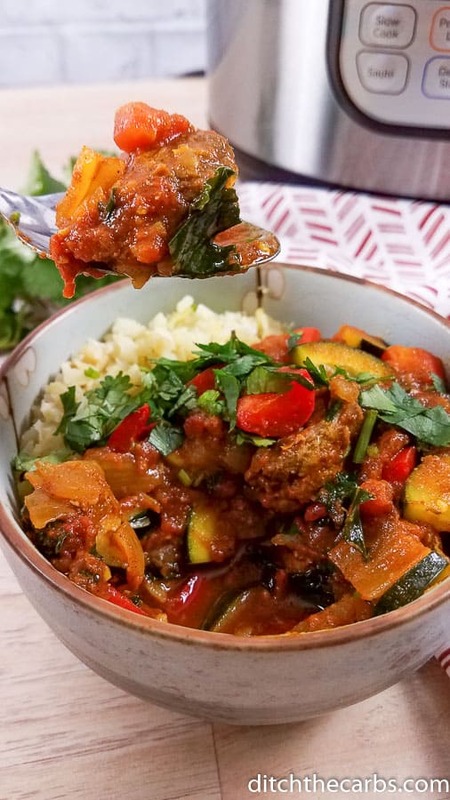 Turn the Instant Pot back to saute mode and add the kale, zucchini, and bell peppers. Allow the curry to simmer for about 5 minutes or until the vegetables are tender. Turn the Instant Pot off and serve. Garnish with fresh coriander or cilantro. 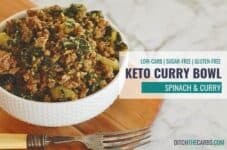 To make this recipe lower carb, almost keto - simply omit the zucchini and bell pepper. They are the biggest source of carbs in this lamb curry. 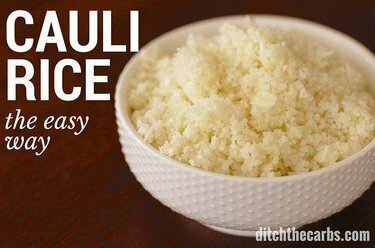 To see my tips & tricks to make cauliflower rice - click here. 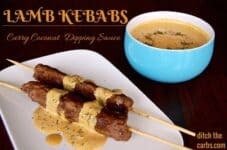 Could this be made with chicken?